As I mentioned last week, I am researching political narrative by investigating the words that come out of politicians’ mouths and are written in press releases by their spin doctors. This research is in the field of political communications. And what has occurred to me through this research is that just about every political journalist in Australia is also interested in political communication. But the problem is, that’s all they’re interested in. The wrapper on the shiny policy launch. The sales pitch for the budget. The salesman for the new policy car. Of course I find any discussion of political communication fascinating and often worthy of a citation in a paper. But that’s just me. The rest of the community doesn’t need to hear about the success of the policy spin job. They care about the actual policy. The thing in the wrapper. The car the salesman is trying to sell. The impact that product is going to have on them. And that is where the political journalists in Australia let the community down. Because they never delve further into the cake than chatting with each other about the icing. A perfect example of this type of journalistic style is Peter Hartcher. All the time. As the political editor for Fairfax’s Sydney Morning Herald, you would think Hartcher might be interested in political policy. But no. After many years of a total dedication to Labor leadership tensions due to his role as Kevin Rudd’s full-time-leak-recipient, he’s taken a few months into the Abbott’s government to work out what his new narrative might be. And predictably policy outcomes still don’t make an appearance. Instead, it would appear he’s settled on the well-worn ‘they’re just as bad as each other’ narrative to report on the Abbott Liberal government. Because that gives him plenty of opportunity to continue with his dedication to Labor bashing. For example, this article from yesterday, helpfully titled ‘Tony Abbott’s Coalition making same mistakes as Labor’ might appear to the untrained eye as an article comparing the previous Labor government’s mistakes with the new Liberal government’s problems. But look closer. This article is not about politics. It is about political communication. In fact I agree with Hartcher that Labor’s communication strategies were, in the most part, not up to the task of selling their highly successful progressive reform agenda and, along with disunity, were a key factor in their 2013 election loss. I’ve written about this failure myself. But, as part of the mainstream media’s synchronised failure to give credit where credit is due, again Hartcher misses to make the point that Labor’s policy success during the previous two terms was phenomenal, particularly in a hung parliament. Over 500 pieces of legislation were passed by the Gillard/Rudd government in their last term. And comparing the first 7 months of Gillard’s government with Abbott’s government is a ‘look at the scoreboard’ moment which should be impossible for journalists like Hartcher to ignore. 127 to 7. Including Abbott’s Knights and Dames farce. 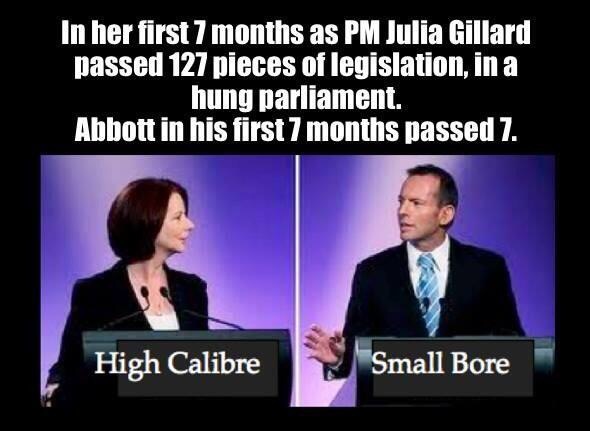 And it’s not like Gillard’s policy successes were minor. The Carbon Price, the Gonski reforms, the National Disability Insurance Scheme, the mining tax, the National Broadband Network. Literally just to name a few. But because Hartcher has decided Labor failed to sell these policies, he’s perpetuating the perception, through his influential position of political editor in the mainstream media, that these policies were failures, when really all he is commenting on is the communication strategy employed by the politicians. “The mining tax is a prime example. A perfectly reasonable policy, based on rational economic principles, that would have given Australia some lasting benefit from a passing boom. When you read these sentences, they seem fair. Hartcher has given the mining tax policy a sort-of-thumbs-up by calling it a ‘perfectly reasonable policy’. But there’s a key element of this ‘doomed’ mining tax that you need to take into account, which happens to be the other topic of my thesis: I’m not just focusing on what politicians say, I’m also investigating how the mainstream media reports what politicians say. Even if Labor politicians while in government were saying ‘the mining tax is a perfectly reasonable policy’ until they were blue in the face, the public didn’t hear this if people like Hartcher refused to report it. Out of curiosity, I had a look at what Hartcher said about the mining tax the day after it was announced. I found this article: It’s not the economy, it’s the election stupid. Remember what I was saying about the ‘they’re just as bad as each other’ narrative? This was a moment where Hartcher could have analysed the mining tax policy from the perspective of a political journalist interested in policy outcomes. This is where the public could have found out how the mining tax is designed to redistribute profits from billionaires and rich investors (mostly foreign) to the people who own the resources: all Australians. This is where, just imagine, Hartcher could have given the Labor government even 500 words of credit for developing a policy aimed at reducing wealth inequality by sharing the windfalls from a once in a generation mining boom. But no. Hartcher wasn’t interested in this type of article. Instead he accused Swan and Rudd of introducing the policy with the populist motive of winning an election. To improve Labor’s sales pitch. Because, low and behold, this is the only part of politics Hartcher focuses on. And in doing so, he’s letting down his audience, he’s letting down his profession and most importantly, he’s reducing politics to a PR exercise. When the audience thinks they’re reading a comparison of Labor and Liberal policies, but they’re really just reading a review of the party’s communication strategies, the community might actually start to think the policies of the two parties are just the same. And look where that has got the community. It’s got us Teflon-Tony Abbott as Prime Minister with a majority of voters who seem to know little about what Abbott’s government was going to do, and are shocked at finding out too late that they don’t like any of it. I wonder if this has ever occurred to Peter Hartcher. Abbott’s opinion polls dived soon after the public saw for themselves the new government’s policies. But if the public had a chance to read about Abbott’s policies before the election, Abbott’s budget would not have been a surprise. By judging Australia’s political journalists on how informed the electorate is about political policy, it’s clear that Hartcher and his colleagues have comprehensively failed. Their devotion to the reporting of political communication instead of policy leads them to blame the failure of Abbott’s budget on the budget sales pitch. But what if the icing isn’t the problem? What if it’s the policies in the budget that are to blame for Abbott’s problems? How about journalists have a look at what politicians are doing instead of focusing solely on what they are saying? What if Hartcher admitted you can’t polish a turd? Or does he know too little about political policy to make this call? Hartcher is a pathetic, putrid coward of a so called journalist who did not have the balls, and still doesn’t have the balls to be critical of anything Abbott or LNP. He hasn’t the brains or the courage to report the facts. He is a LNP apologist and propagandist and is the blame for the reason we have the idiot Abbott. This also applies to his pathetic mates in the MSM. I agree with you about Gillard’s policy successes. it’s interesting – and eminently depressing – to note that all those you mentioned are being systematically torpedoed as we speak. I’d also like to agree with you that the community cares about what’s inside the wrapper, but I’m not so sure. I have a nasty suspicion that the majority of the community prefers to be deaf and blind to the tough meat inside the nice crunchy crust. Which makes it all the more important that journalists remove the crust before it’s served. I also feel very strongly that Rudd’s actions at the time saved us from sliding into the recession the rest of the developed world suffered. This is an issue blithely ignored by all those bewailing the current state of the economy. Thanks Victoria, but I must point out a misuse of the apostrophe that significantly changes what you are saying. When the audience thinks they’re reading a comparison of Labor and Liberal policies, but they’re really just reading a review of the party’s communication strategies, the community might actually start to think the policies of the two parties are just the same. When the audience thinks they’re reading a comparison of Labor and Liberal policies, but they’re really just reading a review of the parties’ communication strategies, the community might actually start to think the policies of the two parties are just the same. You do mean both parties’ communication strategies, don’t you? Otherwise the sentence is very confusing. Part of Hartcher’s problem, I believe, is that in an attempt to be perfectly ‘even handed’, there is no delving into policy detail. Because that would require analysis, and analysis always risks being branded as biased. So today’s media glibly report the horse race, in the belief that this is as far as they can go.